I knew Diana Bliss. Not well, though I’d been to the home she shared with Alan Bond at Cottesloe Beach in Perth and had basked in the same dazzling charm that those who knew her better have recalled in the wake of her tragic death. I will never forget the day we met because even though I was there to see her celebrated husband, we both knew who we were. In fact, we had so much in common that much of our connection was instinctive. Because both of us had been “children of the manse” – in the parlance of the progeny of Protestantism – and our parents happened to have been friends, our fathers Methodist clergymen of the same vintage. After their mutual training as fishers of men, Diana’s father had gone off to minister to congregations in country New South Wales and my father had been sent as a missionary to Fiji. Diana was born a year after me in Temora, New South Wales. And while I was born in Fiji and grew up in the islands, we were reared in precisely the same way – sang the same hymns, said our prayers at bedtime and been reared in the certainty of salvation if one only put one’s hand in the hand of God and the needs of others before one’s self. When they learned from the papers that Diana had teamed up with the notoriously complex Mr Bond – national hero on one hand for winning the America’s Cup, national bounder on the other for being decidedly cavalier with other people’s money – eyebrows were naturally raised among church intimates of the Blisses. Yet for my own parents and many others, this strange union was not a cause for scandal. On the contrary, there seemed to be something verging on the glorious about this hugely attractive young woman coming to the aid of the fallen hero. It was in the best traditions of Methodism, with its emphasis on forgiveness and redemption and innate desire to see good in even the most heinous sinner. For all his faults in the eyes of the law and the financial establishment, Alan Bond was more than usually attractive as sinners go. So there was no purgatory for Diana in the eyes of my parents and others of their ilk in this most unusual of couplings. Perhaps it’s the lingering Methodist in me that makes the observation that Diana Bliss did save Alan Bond. She stuck by him when he was in prison, shielded him from a voracious media and added her own lustre to his decidedly faded star. As her many friends have attested, she was beautiful, charming, kind and exuded a confidence that we now know may have been skin deep. She was the perfect person for Alan. Granted, there have been few people in history with the ability to shrug off misfortune than the sign-writer- turned -billionaire-turned jail- bird who Diana scraped off the floor. Yet there’s no doubt that she played a big part in his personal rehabilitation, from bankruptcy to a new fortune estimated at more than $250-million. What happened in the days leading up to the shocking discovery of Diana’s body in the swimming pool of their seaside home? The whispers have it that she had “issues” and had been struggling with depression for some time. As the saying goes, each marriage is its own private hell. But by all accounts, this was an especially happy one, as it certainly was to my own eyes when I saw them together. The occasion was the death of my employer at the time, Kerry Packer, who’d relieved Alan Bond of more than a billion dollars to enable him to buy Channel Nine, only to reclaim it when the eternal optimist went belly up. 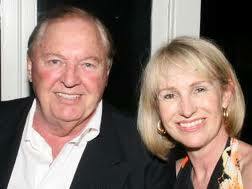 “You only get one Alan Bond in a lifetime”, quipped Kerry famously,” and I’ve had mine”. I’d been charged with making Packer’s network obituary and hadn’t for a moment expected Alan Bond would want to take part. But I was wrong, just as so many people have been wrong about Bond over the years. When we met, he was genial, generous and sporting, fully conceding that he’d been bested by Packer and paying tribute to Kerry’s extraordinary business nous. Did Diana talk him into the appearance? Who knows. But it was a day I will never forget. One of the most striking things was the warmth in the Bond/Bliss household and the affection between the two of them. But there was something more – an acknowledgement by Alan that all his legal travails and a four year jail sentence had only been made bearable by the love of an extraordinary woman. She’d stuck by him, believed in him and they’d now emerged from the ordeal. The man who once owned Van Gogh’s Irises -the most expensive painting in the world – proudly showed me his new art collection, works he’d painted himself while in prison. As we moved around the walls (and the paintings were surprisingly good), the Methodist in me couldn’t help but reflect on the power of redemption and also the power -for a fallen man – of the love of a good woman. 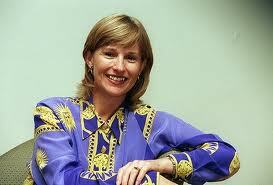 Why Diana Bliss took her own life at the age of 57 we can’t yet say. But being no stranger to depression myself – as well as sharing the internal conflicts of a religious upbringing – leaves me hoping that this admirable woman finally rests in peace. Even in her final days, she was evidently still on a quest for true meaning in her own life. Having been raised a Methodist, she seems to have turned her back on the Uniting Church, the entity it morphed into when it joined forces with the Presbyterians and Congregationalists in 1977. She’s been worshiping at a Roman Catholic church in Perth and it was to a Catholic church that Alan Bond also retreated at the weekend to try to make some sense of this appalling tragedy. Before her death, Alan Bond had been quoted as saying he’d been fortunate to have had “two lovely wives” – the flame haired whirlwind, Eileen, and then “the beautiful Diana”. Yes, she was beautiful. 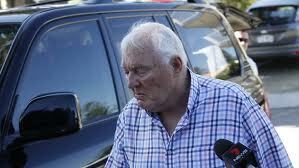 And to see Alan Bond so grief stricken on the evening news was, for me, a moment of immense sadness.